Don’t throw away the pieces! Occasionally, even with all due care, a “value-added” piece of woodwork gets broken. This shot is a close-up of a repair to a broken 12′ long, multi-window sill that I spent quite a bit of time scribing to fit. While maneuvering the nearly finished piece into the room where I was fitting it, I inadvertently bumped the sill into my workbench. 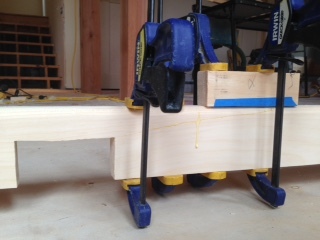 The piece failed from the corner of the notch visible in the photo below, and followed the short grain — a clean split. Headphones thrown, curses uttered. Calmly put the woodwork down and step away! Don’t throw away the pieces! If I had taken out my frustration on the workpiece I’d have been out over an hour’s worth of work, as well as the only quality piece of stock on the jobsite. Instead, the glue bottle, some clamps, and overnight rest yielded a perfectly serviceable sill, with a nearly invisible repair. Probably stronger than the original. This entry was posted in Homebuilding on October 20, 2014 by Isaac Guenther.